Aurora Cannabis, one of Canada’s largest cannabis producers, is ramping up efforts to become a major player in the emerging global cannabis market, seizing on Canada’s role in leading the world toward a legalized cannabis regime. Grow Opportunity recently sat down with Aurora’s chief corporate officer, Cam Battley, to talk about Aurora’s position in the globalization of the cannabis market. 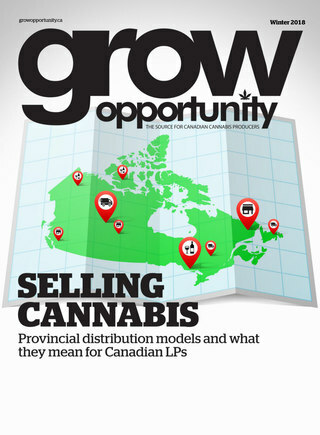 Grow Opportunity: Now that Canada’s legal recreational cannabis market is now open for business, what is next for the industry? Cam Battley: The thing about consumer legalization is that it’s happening at the same time as major catalysts in this industry, including the opening of multiple medical cannabis systems in additional countries. It’s like there’s a cascade of new markets opening up for leading companies like Aurora and Canopy, and a few others. We got essentially three market segments that we are providing for: one is the existing medical cannabis market with our existing registered patients, which at Aurora will always come first. That is a significant group of people –about 350,000 Canadians. The second market segment is the consumer segment and that is the market that currently exists. We don’t have to invent that market as it currently exists. And it’s somewhere in excess of five million Canadians who have been more or less regularly using cannabis for years, sourcing it from the grey/black market. Now they are going to be sourcing it through legitimate providers. The third is the biggest of all, which is the global medical cannabis market. We have seen estimates from analysts that this market will be something like 10 or 20 times the size of the Canadian consumer market. GO: Where does Aurora Cannabis fit into these market segments? CB: At Aurora, we see that we have to participate in each of those markets in a very big way, that is why we have assembled all those capabilities that we have so quickly. It’s why we made ourselves the most fully integrated cannabis company in the world – both vertically and horizontally. It’s why we have completed 10 acquisitions in the last two years. At the same time we have an equal number of strategic partnerships in which we have invested in equity in our partners or working in collaboration to develop new technologies and capabilities. So, we feel a sense of urgency to establish all of these capabilities and to establish our footprint in countries around the world very rapidly, while this window of opportunity is open. By window of opportunity, one of the things I am talking about is that cannabis remains federally illegal in the U.S. It’s a schedule 1 drug. As a result of that, U.S. producers have not been able to compete with the leading Canadian producers in terms of scale of production, in terms of establishing that international footprint. But we don’t know how long that window of opportunity will remain open. At some point, I am convinced, the U.S. will wake up and smell the coffee and legalize cannabis on a federal basis. But I think what we’ve done right now is that we have established what I hope to be an insurmountable lead. GO: Talk about Aurora’s global strategy. Will you be producing locally in countries where you have a presence? CB: We have operations now in a dozen countries and it’s expanding all the time. What you can assume is that wherever cannabis is sold in whatever form, we are going to be present – whether it’s available medically in the future or consumer basis, whether it’s CBD only, we’re going to be there. We are going to be wherever cannabis is legally sold. Very specifically, we intend to be domestic producers in countries around the world. At the moment, we are able to use cannabis grown in Canada to serve medical patients in countries around the world. Longer term, one of the nice advantages that Aurora has is our production technology, specifically our Sky Class facilities. These are extremely high-tech, highly automated, closed system with a glass roof that are unique. Nobody has ever built anything like it. We are the only ones that have this. Everybody else that is doing large-scale production is doing retrofitted greenhouses – and there are some challenges associated with that; they’re open to the air, therefore you have the risk of contamination. In most cases you have to use pesticides and also gamma radiation when you end up with things like mold and mildew. We don’t have any of that. We also get more grow cycles per year, at least double the growth cycles that a greenhouse in Canada is capable of. The best thing about our Sky Class facilities – starting with Aurora Sky and Aurora Sun, which is even 50 per cent bigger in Medicine Hat, and Aurora Nordic in Denmark – is that these facilities have technology that is replicable and scalable on a global basis. That is part of what has made us so attractive to the big players in other mature industries who have been knocking on our door. You can imagine it’s the same old, same usual suspects of brewers, distillers, tobacco, pharma, consumer products and non-alcoholic beverages. GO: What do you look for when forging partnerships and exploring acquisitions? CB: Capabilities that we don’t have. Let me give you an example. We acquired 25 per cent of Alcanna – formerly Liquor Stores North America – they are our cannabis retail partner in Canada. We’re building stores in Alberta and that is our intention in Ontario, should the premier allow for it. What we like about them is that they’ve got capabilities that we don’t have. They are very good at what they do. They have 25 years of selling a controlled substance – alcohol – in a very safe way, with attractive, comfortable stores that draw consumers in. They are great at the operation side of things. What we bring is the knowledge about cannabis and about the cannabis consumer and our vision as to what we feel cannabis retail to look like. That is a very elegant partnership of two well-managed companies that complement each other. That’s the kind of partnerships that we are looking for. On a global basis, we will be looking for a partner, or partners, who have complementary capabilities – whether it be science capabilities, whether it be distribution networks. We certainly want companies with strong reputations and strong networks on a local basis around the world. But it’s got to be global. It’s not going to be local retail. It’s got to be global. GO: Public perception about cannabis will have an effect on the market’s performance and success. How can cannabis companies, like Aurora, change the stigma around cannabis use? CB: Four years ago, when I got into the cannabis business for the first time, there was a lot more stigma. I was not particularly enthusiastic about telling people what I did. They call me the squarest guy in the cannabis business. I’ve been a scout leader for 10 years, been a soccer coach for 10 years, and my whole career background is biopharmaceuticals. Fast forward four years, it’s literally the parents of my scouts and my soccer players who are asking me for updates and what’s the latest. It’s become much more mainstream. The stigma is not all gone, it will take a little bit of time, but it will be based on experience. Experience will do it. What we’ve seen is that the reason why social attitudes have changed so much with respect to cannabis, in part, is because we’ve had a medical cannabis system that has worked very, very well. And so many Canadians now – 350,000 – have a friend or family member who has used medical cannabis successfully for the management of symptoms of a health condition. And that tends to change attitudes. I think experience will continue to destigmatize it. My prediction is in five years’ time, we will look back at this moment of legalization and all the fears that people had, we’ll shrug and go, “Well, it wasn’t such a big deal after all.” The leading feeling at that time will be one of Canadian pride.